Tom Shields of the NCAA champion Cal mens swim team (left) was named Pac-12 Swimmer of the Year, as was Caitlin Leverenz (left), who led the womens team to an NCAA title as well. If Cal was a nation, it would have placed third in this summer’s Olympic swimming medal count. The pool is definitely Bear territory. The London 2012 Summer Olympics brought together more than 10,000 athletes competing in 302 events across a little over two weeks. Cal athletes represented 18 separate nations, from China to Brazil to Iceland. Leading the medal charge for the Bears was five-time individual NCAA champion Nathan Adrian. A 2011 graduate, Adrian swam in the 2008 Beijing Summer Olympics for the U.S. while attending Cal. He earned a gold medal, but only for his role in the preliminary heat of the 4×100 free relay. London 2012, however, proved much more fruitful. In the 100 free, the crown jewel of sprint events, Adrian shocked Australia’s James “The Missile” Magnussen by one one-hundredth of a second. He also took another gold medal as the anchor freestyle leg in the 4×100 medley relay and silver in the 4×100 free relay. On the women’s side, Dana Vollmer further boosted her legacy as a swimmer. In her signature 100 fly, she began by besting the American and Olympic record in the qualifying heat. The next day, she seized the gold medal and a new world record with a blazing 55.98 time. 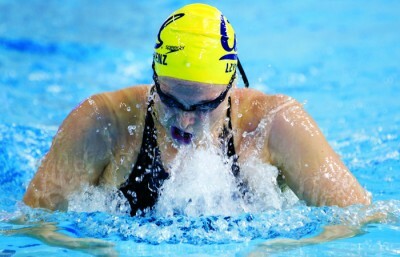 Vollmer would additionally take gold in the 4×200 free relay and the 4×100 medley relay, in which she and her American teammates set another world record (3:52.05). Natalie Coughlin, a 2008 Beijing Olympics standout, only managed to earn bronze as a contributor in the 4×100 free relay heats. It did, however, give her 12 Olympic medals, tying her with two others for most career Olympic medals won by a female American athlete. Among the 11 swimming medalists, two are current swimmers. Rachel Bootsma, an incoming freshman, swam in the 4×100 medley relay qualifying heats (along with Bears alum Jessica Hardy), that later took gold. Senior Caitlin Leverenz won the only other individual swimming medal in the 200 IM, taking bronze with a time of 2:08.95. Outside the water but still at the pool, Teri McKeever served as head coach of the U.S. Olympic women’s swim team. The position comes after two assistant coach terms in the 2004 and 2008 Olympics and marks her as the first female head coach of the U.S. women’s swim team. McKeever, who has been with the Bears since the 1992-1993 season, always takes at least a few Bears to each Olympics and returns with a few medals in hand. As great as these Olympics were, the 2016 Olympics in Brazil could bring in even more medals. Bootsma is only this year an incoming freshman among a number of incredibly talented underclassmen. Additionally, Missy Franklin, a 17-year old phenom who took four gold medals and one bronze in London, may be joining the Bears. Her coach during the Olympics, McKeever, and her favorite athlete, Coughlin, are both Bears and she will be visiting the campus this week.